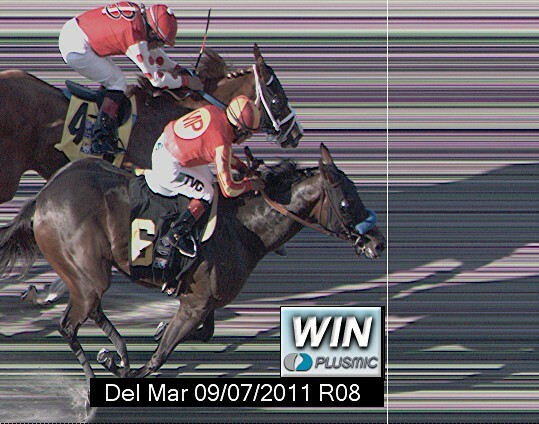 A thrilling and wild finish occurred in the final stakes race of the meet at Del Mar last week. Not only did it appear there could be a blanket finish moments before the wire, but a bumper car-like scene added to the suspense of who would straighten out and who would be taken down. Creative Cause, Drill, and Majestic City, the three favorites, surged past the field on the outside in the final strides. It was Drill who would stick a neck out in front and take the prize. Replays soon showed second place finisher Majestic City severely rammed into Drill while taking a left handed whip from David Flores. That blocked Creative Cause from coming through and would later result in Majestic City being disqualified to third. Martin Garcia rode Drill to the victory and decided to keep the colt just off the front group of pacesetters in the early going. Trainer Bob Baffert, who notched his 10th Del Mar Futurity win, seemed pleased with the trip, especially considering Drill was knocked sideways by Majestic City causing Garcia to lose his whip. Drill is currently not nominated to the Breeders’ Cup, which is somewhat unbelievable considering his breeding and the fact he was pointed to the September Yearling Sale at Keeneland. At this stage his owners would have to put up a $100,000 nomination fee and there is no indication of whether they are planning to do so. Drill’s next race will come in the Norfolk S. (G1) at Santa Anita on October 1st where he will most likely meet Creative Cause again. Majestic City’s next race plans are still to be determined with his connections still deciding whether to continue to stretch him out or keep the colt at sprint distances. An almost full field at 13, including 3 stakes runners (2 wins, 1 place) entered the gate in Saturday’s Arlington-Washington Futurity (G3). Longshots led by Ville made up the first group out of the gate setting swift fractions. The favorite Take Charge Indy and eventual winner Shared Property stayed in the middle of the pack awaiting their opportunity to pounce. Entering the turn for home the pacesetter and rest of the front group began to retreat quickly while the better-backed entries seemed poised to make a run. Previous stakes winners Hogy and Twelve Hundred did not answer the call however, while Shared Property and Take Charge Indy began to separate themselves from all challengers, despite both running greenly. Shared Property, under Leandro Goncalves, proved to relish the mile distance the most by eventually winning by a length. Motor City completed the trifecta another 2.5 lengths back. Trainer Tom Amoss indicated Shared Property would like even more distance and that the Breeders Futurity (G1) at Keeneland in October is the next logical step. He will most likely meet Take Charge Indy and Motor City there as well. Although we covered the Hopeful (G1) last week, there was a notable maiden race on the undercard that deserves some space. In extremely sloppy condtions, Seeker was able to dominate his rivals by 6.5 lengths in his second career start. Hammered at even odds, Seeker sprung from the gate to take the lead and never look back. Jockey Julien Leparoux kept him to task in the stretch but eventually geared down substantially upon hitting the wire. The Asmussen charge is a homebred by Hard Spun who finished 2nd in the 2007 Kentucky Derby, 3rd in the Preakness, and 2nd in the Breeders’ Cup Classic that same year. Seeker’s dam was a multiple stakes winner at 6 furlongs, and her offspring are sprint stakes winners as well.